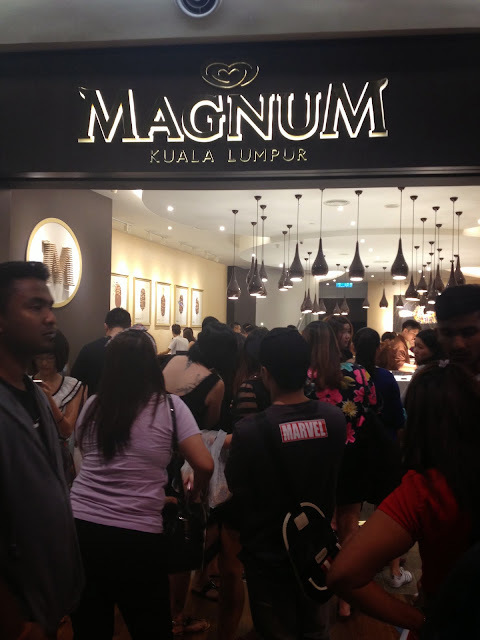 When was the last time any of us queued for ce-cream? The last I remember was when I was a kid and the ice-cream potong guy would come around on his motorcycle and all the neighbourhood kids (and their maids) would crowd him to get their ice-cream fix. Because we were kids, we had no concept of queuing. Fortunately, as adults the concept of queuing (ie waiting for our turn) is not lost on some of us. 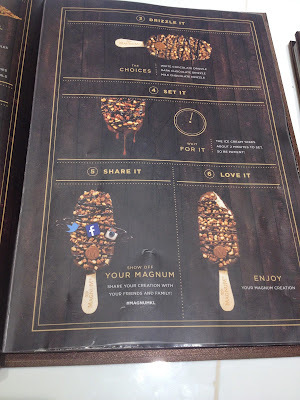 Point in case: the new opened Magnum Cafe in Midvalley Megamall. You know what they say, a crowd draws a crowd and this rings very true with Malaysians. Since its opening in November 2014, the Magnum cafe has seen hordes of adults and teenagers queuing patiently outside its two-floored cafe on the highest floor of the mall. All to customise their dream Magnum. 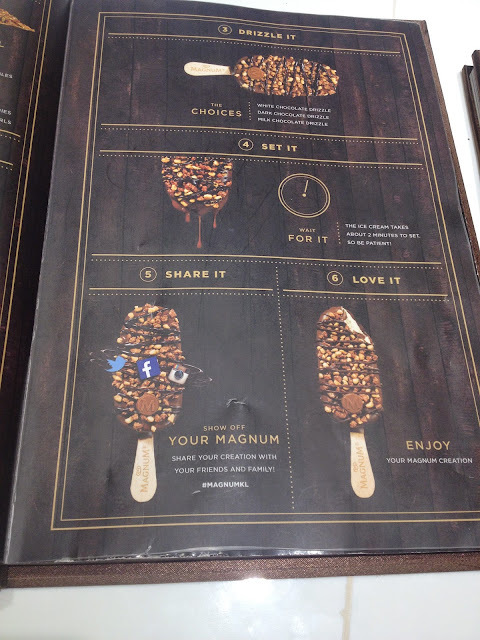 The concept that allows customers to 'design' their own Magnum ice-cream has spawned outlets in Bangkok, Singapore and now Kuala Lumpur. 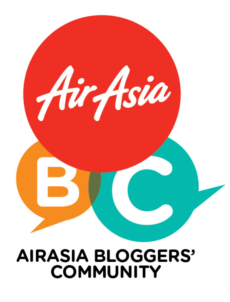 We Malaysians are generally very proud about our creativity with food and this gave us that opportunity to flex that creativity. 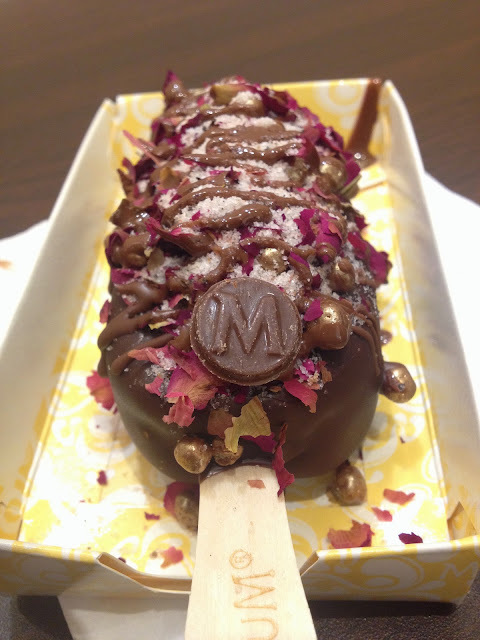 Anyway once you have waited patiently in line for about 20 minutes (I did), you will be rewarded with an opportunity to design your Magnum. At a price of RM9.90. First, you pay and a receipt confirming your order will be given to you. Pass that receipt to the ice-cream barista and pick out three toppings. It can be anything you want. I selected gold nuggets and culinary rose petals (for visual sake) and pink sea salt...thinking it would go well with the dark chocolate coating. 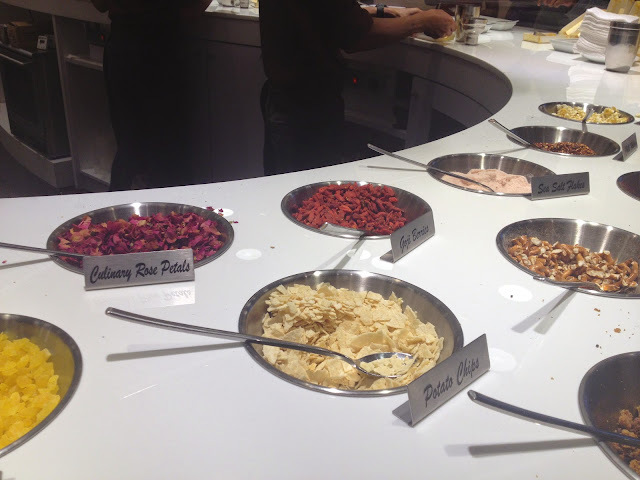 The barista will mix the toppings inside a drink mixer and shake it thoroughly. Before that, pick your ice-cream base: classical vanilla or chocolate brownie (which looks like chocolate ice cream to me). The base is then dripped in a chocolate coating of either dark chocolate, milk chocolate or white chocolate. I picked the dark chocolate...because it was supposed to go well with the sea salt. The coated ice-cream is then lovingly laid out on a paper tray like a cadaver in the morgue and the toppings are then carefully sprinkled all over it on both sides. 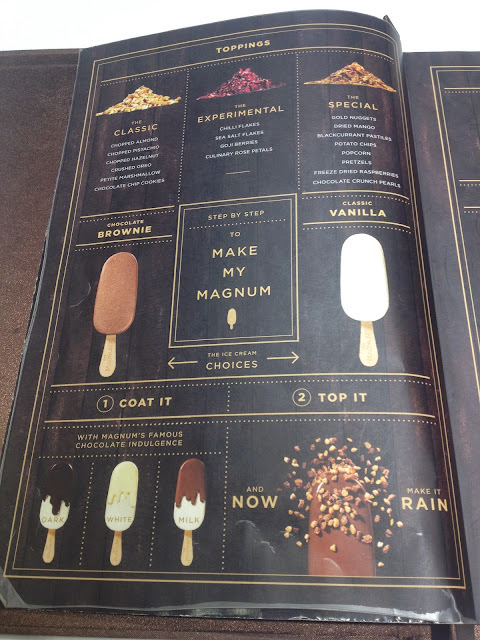 The barista knows presentation is important and ensures your Magnum is a masterpiece. 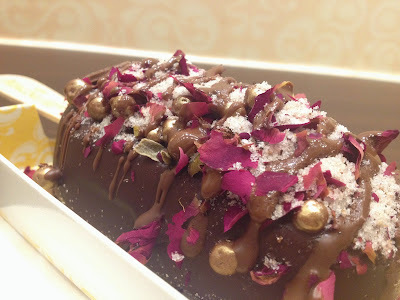 The final step is to drizzle one of three chocolate coating all over it and finally, a Magnum chocolate bit is placed on it (because, ya know, branding). And voila! Your Magnumpiece is completed. In the two minutes that it takes for it to set, spend the time to snap photos of it and selfie with it as Magnum had intended for you to do. Share it on social media as Magnum had intended for you to do. How else will you show the world your Magnumpiece? And finally (30 minutes of pictures later) dig in and enjoy the intense combination of flavours of your choosing. Or in my case, revolt against the intense combination of flavours of my picking. Sea salt - not a good topping when it has not been mixed into the dark chocolate. And especially very bad when a fist full of it was thrown atop my ice-cream. It felt like I had taken a gulp from the Red Sea. If I was a leech or a snail, I would have shivered up and died. 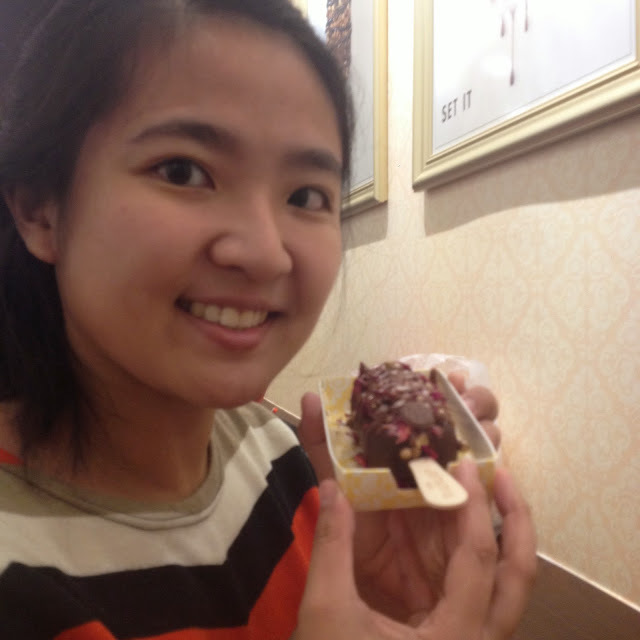 It was the worst thing I willingly put into my mouth and since I made it, I didn't want to let the ice-cream go to waste. So like a perpetual child refusing to eat her veges, I ate around the sea salt (no easy feat I tell you) and managed to finish my Magnumpiece. I was left nauseated and needing a glass of water and a regular classic Magnum. So let this be a lesson to all you future ice-cream artist out there...if the barista asks if you want more or less sea salt, always say less! The Magnum cafe is on the same floor and side as Golden Screen Cinemas. To dine in, head to the second floor. To customized your Magnum, go to the first floor. Ps: I think I lost track of where this post was headed.